You might have just tied your best ever fly but if you can’t finish it off properly it isn’t going to stay in one piece for very long. Almost as important is the ability to start a fly correctly. This means catching in the thread then laying down a solid base of thread-turns that will support all the other materials. 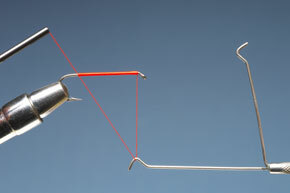 It might seem a bit of a waste of time, when there is the prospect of tying your first fly, but it’s a good idea to spend a while practising both of these techniques. That way you ensure your finished fly will stand up to the rigours of casting and, hopefully, being taken by a fish. 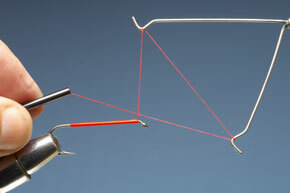 ONE of the trickiest techniques for the novice is that initial running on of the thread along the hook shank. It’s just one of those funny little processes that, once learnt, need never be thought about again. You just need to get it right in the first place for, without it, starting off a new fly pattern can be a real headache. So, in order to show exactly what’s going on, in the following step-by-step sequence I have used a much thicker thread than normal. 1. Fix the hook securely in the vice and hold the thread so the loose end is above the shank and the bobbin holder end is below it. 2. 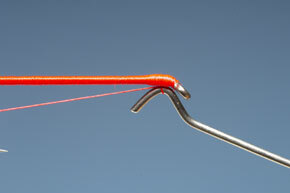 Raise the bobbin holder so that the thread now forms a V-shape close to the eye of the hook. 3. Pull up on the loose end of the thread slightly to apply tension. Next, begin to wind the thread down the shank. 4. 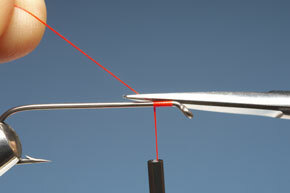 Keeping the thread under tension at all times, apply six or seven turns to lock the loose end in place. Now remove the excess with scissors. 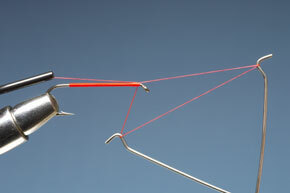 This is a continuation of the running-on process and forms the basis of a well-tied fly that will catch fish after fish. Once the loose end of the thread has been fixed and the excess trimmed off, the thread should be wound in tight, touching turns all the way to the bend. Try to leave as few gaps as possible so that the finished bed of tying thread forms a solid base for the rest of the materials. This is the standard way of finishing off a fly; and it is also the most secure. Five turns are ample though you can get away with three or even two turns on a small nymph or dry fly - especially so if the tying thread is waxed to make it slightly sticky. The finish itself consists of a series of loops formed over the loose end of the tying thread. So, when the loose end is finally drawn tight the loops pull down on to it securing it in place, after which the excess thread is trimmed off with scissors. The fact that the loose end of the thread is now secured prevents the fly unravelling, though for added security, a coat or two of lacquer may be applied to these bare thread turns. 1. 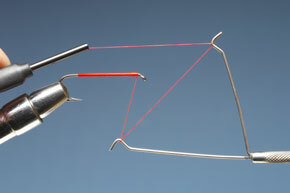 Hold the tool so the straight arm is parallel to the hook shank and loop the tying thread over the hook. 2. Keeping the whip finish tool in position, feed some thread from the bobbin and loop it around the hook on the angled-arm. 3. Revolve the tool in the fingers so the straight arm is now positioned above the hook shank. The thread should form a back-to-front figure 4. 4. Position the bobbin holder end of the thread so it is parallel with the hook shank, then revolve the tool half a turn to make the first loop. 5. With the loose end of thread caught in by this loop make further turns of the tool to apply another four loops. 6. When all five turns have been applied flip the thread off the hook on the straight arm but retain tension on the loop with the angled arm. 7. Pull the loose end of the thread so that the loop draws tight. Carry on pulling until the arm is close to the hook. 8. Finally, slip the arm out of the loop and pull it tight. The waste end may now be trimmed away using scissors.